A ductless split air conditioner is one of the most revolutionary, comfortable and convenient ways to improve your standard of living with convenience of a modern cooling system. 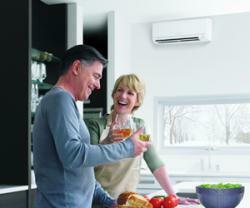 Good for your wallet - it’s the most energy-efficient of all air conditioners! Completely unobtrusive - no ducts necessary! Have the perfect room in mind? Request your FREE in-home consultation today!